Hardback, with beautiful cloth spine. 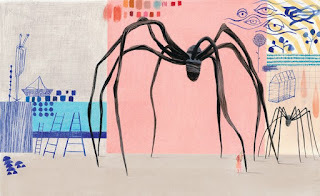 I studied the work of Louise Bourgeois when I was doing my design degree a few years ago, yet in this picture book was much information that I never knew, and now her work makes much more sense to me. I've also been surprised, as I've talked to people about this book, that so many have never heard of her. 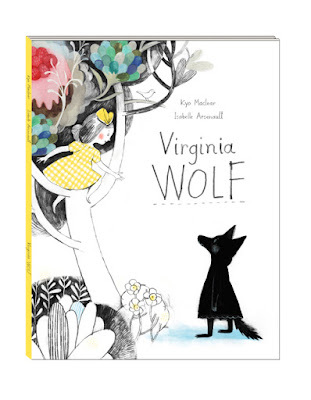 I hope this picture book will bring many readers to discover this complex artist. Louise was born in 1911 to a family of tapestry repairers. They lived by a river that played a big part in her life. When she was old enough she learned to help with the tapestry work. Her mother taught her how to weave the broken threads together, to sew, to appreciate colour and form. 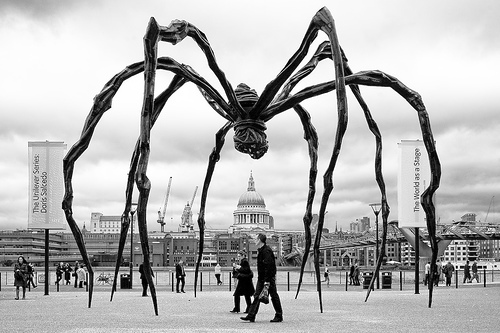 She was the primary influence on Louise's art. (What they don't tell you in the book, which I learned in this excellent review, was that she was also motivated by the bad feeling towards her father, who had an affair with the governess, creating uproar in their lives). Her father didn't work in the family business, but travelled a lot for his job, always bring back a beautiful dress or other garment for Louise. She went to Paris to university, studying mathematics, particularly geometry and cosmography (the stars), but when her mother suddenly died, Louise dropped her studies and began to create art - painting, drawing, sculpture - her best known work being a huge (30 feet tall) spider called Maman (Mother), in tribute to the mother who could repair the threads of broken fabrics, just as a spider repairs her web. Louise gathered all the fabric of her life - all the dresses and the garments her father had brought her; all the bed linens, towels, tablecloths, her new husband's handkerchiefs - and she cut it all up. And then she spent the rest of her life putting it back together again. This spoke to my own attachment to things from people I love have left me - I have a trunk full of fabric which includes some belonging to both my grandmothers, much loved clothes of my own and my children. I can't seem to give it up. Perhaps I'll make something with it myself one day. The text, which is set out on each page like a poem, in a tidy hand-drawn capitals, tells the story of this life in a straightforward but poetic way, delicious vocabulary capturing the passion of the life and work. The illustrations are by Isabelle Arsenault, who I had first discovered in the beautiful book Virginia Wolf, written by Myo Maclear, about a little girl who is depressed and takes to her bed, and her sister who paints a marvellous garden on the walls of the room to draw her sister out of her gloom. 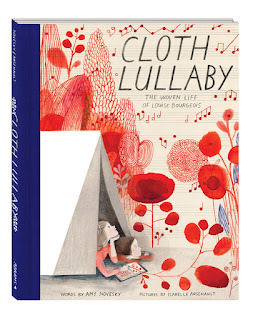 The illustrations for Cloth Lullaby are just as wonderful, rich in pattern and texture, while limited to blue, red, black and greys, with a tiny touch of yellow. Each page is a wonder that I've pored over, wondering how she had achieved each texture and the way each element relates to Louise Bourgeois life and work so well. I was very lucky to be gifted this book by the lovely Jackie Taylor from Miller Books who came to see me at school so I could purchase some books for our library, though not as many as I would have liked as it's getting to the end of the budget at this time of year. When I'd picked out all the books I could buy, I was still clutching Cloth Lullaby in my arms, but couldn't justify putting it in the library at the moment, there were greater curricular needs. So thank you Jackie, this is real treasure.